Net neutrality ended in late November 2017 when the FCC re-wrote the rules governing Internet Service Providers (ISPs). This decision went against the wants, needs and opinions of both technology companies like Google and Netflix, small businesses and 83% of the American public. (Fowler) If you missed the news about the change due to end of year fundraising or the continual media deluge of headlines regarding other government policies or shutdowns – keep reading to understand what the change means for your organization and how to influence lawmakers to reverse the decision. If you ARE the go-to person on all things on the fight for net neutrality, please comment below with your recommendations and thoughts for next steps. In 2015 policy went into place that moved broadband internet access into the status of a utility (common carrier) much like electricity or phone service. This prevented ISPs from charging users more to see certain content, or otherwise creating a ‘fast lane’ and a ‘slow lane’. Or as President Obama said In 2014, “There are no toll roads on the information superhighway.” (Nusca) In a net neutral environment, ISPs display all websites or internet content at the same speed to a user and the user has access to everything on the internet if s/he knows the address or the appropriate search terms. ISPs or cellular phone companies cannot block certain content. This situation provided an equal playing field for users and all businesses regardless of size or budget. The marketplace of where you went for your content was determined by interest, SEO, and advertising. The ISP marketplace was not utopia, and those with larger pocketbooks could definitely purchase overall faster speeds. ISPs, however, wanted the internet to be governed more like cable television and they successfully convinced the FCC that this was the better option (perhaps because the largest companies in the sector are ALSO cable television providers like Comcast and Verizon, companies losing business to cable-cutting users accessing OTT entertainment). Thus, with the new policies there is a new a fast lane and slow lane for content providers and content is a marketplace now controllable by the ISPs. For users, that means that they pay their ISP for content (paying more for access to some content over others) AND for speed. The image from VOX presents a potential future. For businesses it means that larger companies can pay ISPs to have their content available to users and/or for their content to be delivered at a faster speed. For small businesses, like not-for-profit institutions, content will likely be delivered in the "slow lane" with low priority delivery to users. If you want your community to have easy access to your ticketing page or your online art collection -- accept that it is no longer likely. Put another way, prior to November 2017, content providers paid, at the minimum, for a domain and storage aka hosting. Users paid for access to the internet via cellular or physical connection, the latter most often at work or at home. The content going out from a small business like a local theatre company traveled at the same speed as content from a large business, like HBO. All ISPs had equal access to all content although users are still paying premium for speed. In the new FCC marketplace, the ISPs will be able to make their content privileged to content providers that have paid for better delivery. This ultimately skews the marketplace to larger companies and curtails users' equal access without higher payments. A useful metaphor is a tollroad with an EZPass. Some content providers will have an EZ pass that will allow their content to flow faster. For users, content is equivalent to access to exits. 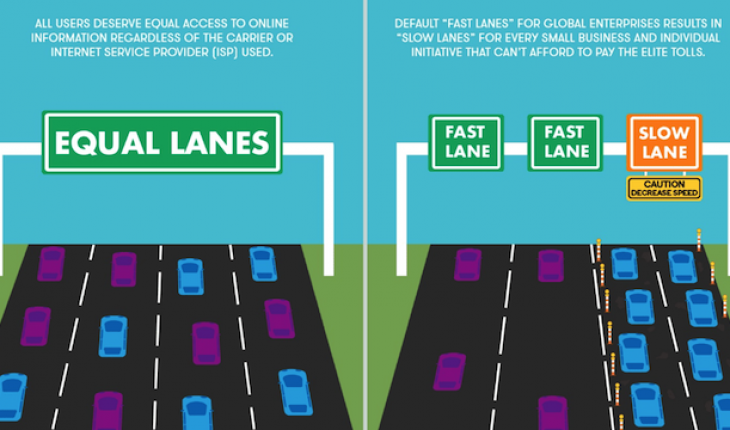 Some ISPs will completely block access to some roads and different users will pay different prices for access to other roads. Equality is removed on both sides and only the tollroad wins. The FCC has changed its policy, but that policy can be over-written by law. Montana and New York State have written laws that prevent state agencies from doing business with ISPs that violate net neutrality. (Paul) AT&T has taken out multiple national ads asking not only that the FCC reverse its policy but that Congress create an Internet Bill of Rights. "Legislation would not only ensure consumers’ rights are protected, but it would provide consistent rules of the road for all internet companies across all websites, content, devices and applications." Half of US Senate already Supports reversing the FCC ruling. (Krastrenakes) Reach out to your senator or representative and ask her or him to reverse net neutrality. Speak to your state representatives and ask them to move forward on state legislation supporting the same. If you’re not sure how, check out AMT Lab’s recent Tech in Advocacy article by Lesly Ceballos.